As a Geography student, Monica Moreno-Espinoza wasn’t about to let a research opportunity slip through her fingers during a two-month trip to Italy. 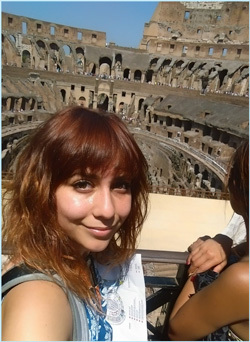 With serious questions about refugees in mind, she paired sightseeing at the Roman Coliseum with 845 interviews of Italian college students from eight universities. She wanted to know what the students thought about the recent upswing in refugees coming to Italy from Africa. Her results would inform a poster presentation that brought the undergraduate student shoulder to shoulder with graduate and doctoral students, and faculty members from colleges throughout the Pacific Coast region. The trip was a two-month visit to see her aunt in Italy and Moreno-Espinoza added stops at universities in Milan, Padua, Florence, Rome, Naples, Palermo, and Catania. As the daughter of immigrants, Moreno-Espinoza has long been interested in issues surrounding immigrants, political refugees and others who have faced leaving their home country. She wanted to investigate the attitudes of Italian students, whose homeland was receiving the majority of African refugees bound for Europe, and to see how those feelings meshed with what Italians were telling her. “I wasn’t sure whether the news specifically was making people racist. However, it was an opinion that some people I encountered would express.” she says. A map showing locations where Geography Student Monica Moreno-Espinoza conducted surveys of Italian college students. Map courtesy Monica Moreno-Espinoza. In October, Moreno-Espinoza traveled with Geography Professor Stephen Cunha to the 79th Meeting of the Association of Pacific Coast Geographers (APCG) meeting at Portland State University, where she shared what she had discovered. She was also awarded for her paper at the California Geographic Society Conference last year. The findings from her report “Mediterranean Refugee Crisis: Italian Student Attitudes Towards Political Migrants” revealed positive sentiment towards political refugees, strong opinions towards other European Union countries, and mixed attitudes on governmental intervention of refugee flow. In the survey, Moreno-Espinoza interviewed slightly more women (54 percent) than men with the majority aged 20-29. While many factors could influence students’ opinions, at all schools except for Naples, well over half the respondents indicated they agreed or strongly agreed with the survey statement “I am pleased Italy is aiding the political refugees coming from Africa.” The vast majority of respondents at all schools agreed or strongly agreed that immigrants aren’t hindering the Italian economy. Respondents were split over the question of whether there were too many refugees for Italy to absorb, while a high number of those asked were undecided whether the Italian government should take steps to reduce the flow of refugees making it into the country. 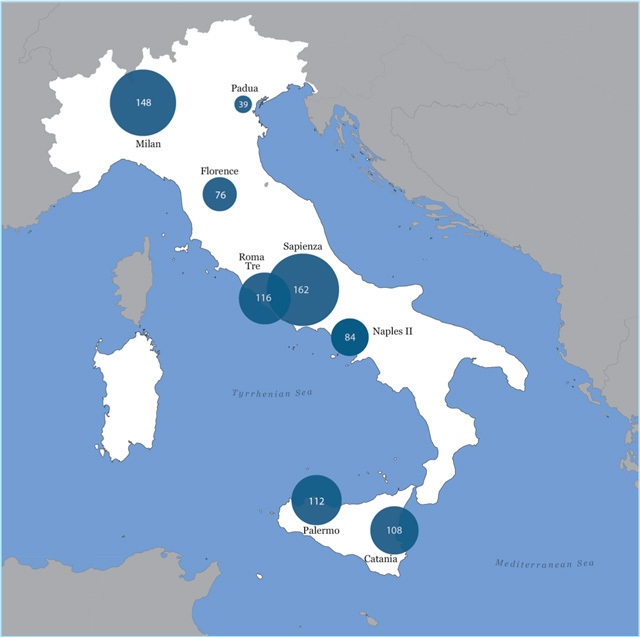 Nearly all respondents agreed or strongly agreed that European Union member nations have a responsibility to help Italy with the recent influx of political refugees. Now in her last semester, Moreno-Espinoza is ready to take some time off from school before pursuing graduate studies. Her curiosity is piqued by human affairs and environmental issues, but her mind keeps coming back to the issues of immigration and political refugees. “Every time I present on this project I think I want to do more research about immigration. I’d love to do the surveys again and see how college student attitudes change over time,” she says.